The WD Purple microSD card is borne out of extensive analysis of three generations of industrial products to specifically address the surveillance market. With its high endurance and 32GB capacity, the WD Purple microSD card provides long-lasting on-camera storage, and its support for card health monitoring functionality allows for pre-emptive storage management. It offers exceptional performance and reliability to meet the 24/7 continuous high-definition video recording workload demanded by the growing number of surveillance applications. 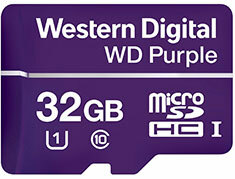 Trust Western Digital to deliver WD Purple - the ideal microSD storage for video surveillance cameras and edge devices.